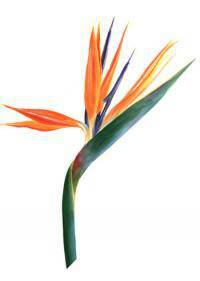 Strelitzia is also known as Birds of Paradise for its appearance. The unusual bloom shape closely resembles that of a tropical bird. It is also commonly called a crane flower in parts of South Africa. This tropical plant is widely prized for its unusual bloom appearance. It is cultivated as a houseplant, ornamental plant and cut flower. With proper care, it can produce spectacular displays of color. Strelitzia nicolai is often called the Giant White due to its color. It is also known as wild banana as it is similar to a banana plant. The blooms are very large and are primarily a creamy white color. S. juncea is known as the Narrow Leaf for the shape of its leaves. It is native to South Africa but may be grown elsewhere with care. It is known for being drought resistant and has low water needs. A frost resistant species is also widely used in areas with frost. This frost resistant variety is widely sought after for gardening. It produces a blush and yellow bloom with silver colored leaves. S. reginae brings deep leaf color and vivid orange and red blooms. This is often the most commonly found species for the United States. The cut flowers are widely used in bouquets and floral arrangements. Birds of Paradise are often used for landscape planting or gardens. They are perennial, and may take up to several years to first bloom. The large dark leaves provide a rich and lush background in gardens. For the best blooms, a north or eastern exposure is often the best. This indirect sunlight will produce better blooms than full sun. Full shade areas should be avoided for many species of these plants. Frost is a potential problem for most varieties, causing early wilt. Warmer climates are best, especially those with higher humidity. A base of mulch can help with creating more moisture for plants. In dry periods, frequent watering is necessary for root growth. A basin watering method is often recommended for the best results. This encourages deeper roots that will ensure the plant thrives. Too much or not enough moisture often leads to yellowing leaves. Yellowed leaves should be removed and discarded for plant health. This may also occur if too much mulch touches the stem in gardens. However, Birds of Paradise are still a very sought after flower during the hot seasons of spring and summer. They are more often purchased by themselves than in mixed arrangements and are usually purchased in areas including West Jordan, UT, Lansing, MI, Miami, FL, Glendale, CA, and Jersey City, NJ. One of the most popular flower meanings is that of finding paradise. This may be through a new friend, love or a promotion in a career. This flower symbolizes happiness and contentment in the position. It can also represent taking flight and reaching new goals in life. This may be applied to those starting a new job or education path. These are often arranged with other tropical flowers and stems. The distinctive blooms can also be used to show uniqueness in feeling. An exotic endeavor or special love can be expressed with these. Birds of Paradise are often popular bouquets in spring and summer.